" For the Chickadees " by Robert Duncan is one of the Fine Native American Art, Western Art, and Wildlife Art prints and posters available from Native American Expressions. We invite you to browse all of Robert Duncan 's Fine Art. " 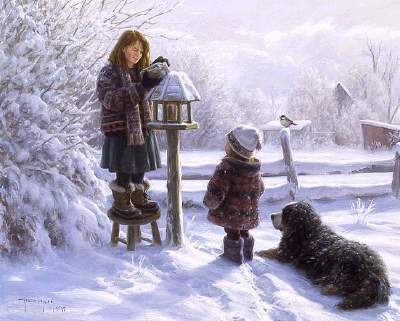 For the Chickadees " by Robert Duncan is also available custom framed by our professional framing staff.
" For the Chickadees "
Fine Native American Art, Western Art, and Wildlife Art prints and posters framed in rustic mouldings. found at our Native American Expressions Gallery. All prices and information on this Website are subject to change without notice. Images contained on this website are copyrighted and property of their respective owners. Any reproduction or distribution of the images, software, or files contained on this Website, electronically or otherwise, in whole or in part, is a violation of copyright laws and is strictly prohibited. Not all artists on this website are Native American.